This vacation rental vacation apartment is located in Florence, Tuscany in the prestigious part of the historic city center of Florence. 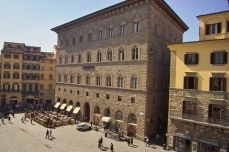 Via Tornabuoni is the Rodeo Drive of Florence and Italy with it`s exclusive boutiques & famous Palaces such as Palazzo Strozzi. The apartment is in one of these beautiful historic Palaces. Step outside and you are in the middle of magical Florence. The perfect vacation rental apartment has been totally restored by a well known Florentine architect taking every precaution to restore the original stonework, the magnificent antique wooden doors, terracotta and parquet floors. 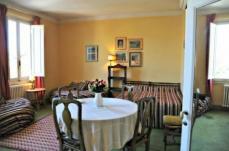 Illuminous with 2.5 meter high windows, comfortable new beds, new bathroom and kitchen with all modern conveniences. The windows look onto the famous street and palaces below. Tuscan style kitchen, original ceilings in a spacious living room. 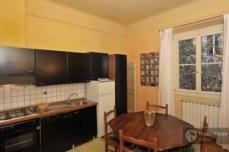 There is a dining area and the 3rd bedroom is a loft type room with 2 single beds, sitting corner and desk. There is a second loft over the living room that has a additional sitting room and a small single bed room , ok for a teenager Bathroom with shower, hand dryer, hair dryer. The apartment is very quiet. Very cool in the summer with full airconditioning. Close to everything. Florence is one of the worlds jewels. It is an incredible adventure back in time. The historic center exists unchanged as it has for centuries and one never stops to marvel at its wonders. We will assist you during your stay to make your vacation as pleasant as possible. In minutes one can escape to the beautiful Tuscan countryside. Tony Jun 14, 2013 17:06 I just want to tell you what a marvelous time we all had in Florence last week. Our stay was made all the more enjoyable by the beautiful apartment Ã�Â¢Ã¢â��Â¬Ã¢â�¬Å� Strozzi 1. We have stayed with you before in Strozzi .we were with the Ruanes in February 2 years ago and I`m sure we`ll come back again.